"One of the constants in the history of Wakefield, from the time of its inception in 1644 until the present day, has been the First Parish Congregational Church. Currently located on the corner of Church Street and Lake Avenue, the church is actually the fifth structure to have been built by parishioners over its 300 year history. The first church was established by the residents of the town near the corner of Main and Albion Streets. The small structure sufficed until 1688 when the parishioners built a new church near their present location. This second structure existed until 1768. 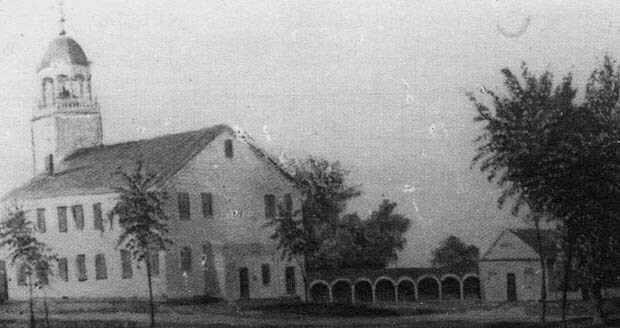 The third building was erected in 1768 and faced West, but was turned to face South many years later. The tall spire on this church became the victim of the great gale of 1815 and was replaced by a dome-shaped steeple. This, too, was replaced by another spire when the building was turned. The edifice was in existence until 1890 and replaced by the gray granite structure in 1892. The church was partially destroyed by fire on February 21, 1909. 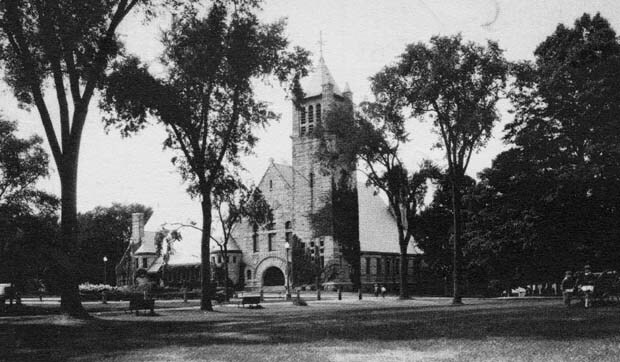 Parishioners worshipped at various locations, including the Town Hall, for the next three years until the fifth and current structure was completed in 1912. The church has been heralded throughout the years for its Byzantine-Romanesque architecture and the beauty of the interior." -- Text from calendar. ;Captions: 1. The First Parish Congregational Church in 1768 as depicted in this painting by Franklin Poole. The building was built to face West but was later moved South in 1859. -- 2. 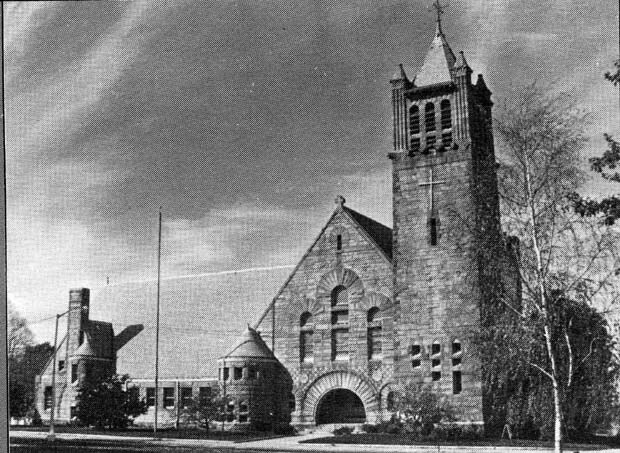 The church in 1930. -- 3. Today the church is still recognized for its architectural beauty. Photos courtesy of the Payro family, Louis Picardi and Bourdon Studios. “First Parish Congregational Church,” NOBLE Digital Heritage, accessed April 22, 2019, https://digitalheritage.noblenet.org/noble/items/show/6942.